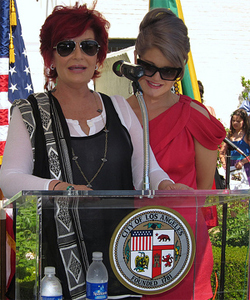 Kelly and Sharon Osbourne joined Los Angeles Pride yesterday and took to their microphones to tell anti-gay protesters where to go. Mother and daughter – who were acting as the parade’s Grand Marshals – were quick to answer back to the Christians. Reports say they then lead gay revellers in drowning out noise from the protesters. The pair have supported gay rights in the past, while Kelly allowed herself to be photographed for the NOH8 campaign, against California’s gay marriage ban. A source told MailOnline.com: “Kelly and Sharon were amazing. They didn’t look intimidated by the protesters for one minute – if anything, it was exactly the opposite, they relished the fight!